2019 greetings! Thank you for keeping it real in the New Year. The boxing world has such momentum from 2018 I just can’t wait for the big matches followed by your educated breakdown. Any chance we will see you commentating another PPV ala Golovkin Canelo 2? Did you see ShoBox Friday night? I tuned in for the Ruben Villa vs Ruben Cervera fight and it felt like I was watching college football (in a good way). That is, it was some tremendous, young athletes giving it their all without the drama and ego of the top pros (to take nothing away from Villa and Cervera as young, professional prospects). Villa’s footwork was mesmerizing against a flat footed opponent and he showed that he can take a good punch, not get riled and make small changes to execute his game plan. Which brings me to my point – how would you compare his performance against Haney’s? I found myself disappointed with Haney and unsure if he is deserving of a Ring Top 10 spot. He has some strong fundamentals, I think, but when fighters work so hard for the knockout to make a statement I think the statement they are actually making is that they are most concerned with making a highlight reel (Jermell Charlo comes to mind). I mean no disrespect to Haney, but he recently called out Vasiliy Lomachenko and all the top fighters at 135. In addition, the ShoBox announcers were working hard to paint him as a top contender, but I hope he takes his time, builds his skills (and his brand) and takes a few more tough fights before challenging for a title. How do you think he would fare against The Ring 6-10 contenders? I think he has beat some fringe contenders, but I think he should hold on calling out the big dogs. Anyways, I look forward to Villa’s next fight and will jump on the Haney bandwagon if he is able to take his time and mature with a few more fights before a big one. Thank you, Phil, and thanks for sharing your thoughts on two very promising young boxers. There’s no reason to pressure yourself to jump on or off the Haney bandwagon this year. He’s 20 years old. It’s OK to take a “wait-and-see” stance with boxing. This goes for young up-and-comers, new champs, questioning the hall-of-fame worthiness of elite boxers that are still fighting, wondering how boxing partnerships (boxer-promoter, boxer-trainer, promoter-network, etc.) will work out, and most industry rumors. How would Haney fare against The Ring’s lower top-10 (Nos. 6-10) lightweight contenders? I think Haney, who is The Ring’s No. 8-rated lightweight, would do well. I know he’s not a complete fighter yet, but he’s smart and talented, he’s dedicated and constantly learning in the gym, and he’s very ambitious. Even seasoned veterans will have a hard time discouraging him in the ring. I’d pick Haney to outpoint everyone (which includes Francesco Patera, Emmanuel Tagoe and Ray Beltran) except for Jose Pedraza (our No. 6-rated lightweight). Did you see ShoBox Friday night? Yes, I did. I missed the opening bout, but I got seated in front of my TV before the Villa-Cervera fight got underway and I enjoyed the ring action and astute boxing commentary that ShoBox always delivers. I tuned in for the Ruben Villa vs Ruben Cervera fight and it felt like I was watching college football (in a good way). I’ll have to take your word for that. I don’t think I’ve ever watched a college football game in its entirety (and that includes live games I attended at Missouri State University – then known as Southwest Missouri State University – back in good ole Springfield during the 1980s). That is, it was some tremendous, young athletes giving it their all without the drama and ego of the top pros (to take nothing away from Villa and Cervera as young, professional prospects). I gotcha. Villa was top amateur and now he appears to be on his way as a notable pro prospect. He’s got a good training and promotional team behind him, so I have no doubt that he will continue to develop. Cervera is a very raw talent, but he’s also got potential. Villa’s footwork was mesmerizing against a flat-footed opponent and he showed that he can take a good punch, not get riled and make small changes to execute his game plan. Villa is a featherweight technician to keep an eye on. He’s bright, he’s got a very solid foundation (balance, foot and hand placement, movement, offense/defense form, etc.) and he’s a southpaw. And, as you noted, he’s remains focused throughout his fights. He’s got poise and a mature temperament for a 21 year old, which means he’s gonna be a handful as he progresses. sure that I’d bother. They are at different levels at the present time. Villa is at the eight-round level and he’s fighting solid-but-unproven/unpolished opposition. Haney is at the 10-round level and he’s facing fringe contenders (last three opponents). The only thing I’ll examine is their styles and form. I think Villa has better technique and stays within his boxing style better. 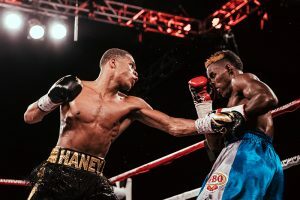 I think Haney is the better athlete but he strays a bit from his technique and boxing style (he may well develop into a world-class boxer-puncher one day, but right now he detracts a bit from his talent and skillset by pursuing the KO as hard as he did against Xolisani Ndongeni). I found myself disappointed with Haney and unsure if he is deserving of a Ring Top 10 spot. We’ve got him at No. 8. Would you put our Nos. 9 and 10 ahead of him? Would you replace him with a currently unrated lightweight? Who, and why? He has some strong fundamentals, I think, but when fighters work so hard for the knockout to make a statement I think the statement they are actually making is that they are most concerned with making a highlight reel (Jermell Charlo comes to mind). Well, the lad is his own promoter. I mean no disrespect to Haney, but he recently called out Vasiliy Lomachenko and all the top fighters at 135. He’s clearly not ready for the likes of Lomachenko, or Mikey Garcia or even Robert Easter Jr. And I think a tall, technical, mature southpaw like Luke Campbell would give him fits at the present time. But I won’t hold it against him for calling anyone out. He’s 20. I felt invincible at 20 and I was just a nerd liberal-arts college student. That’s what 20-year-old guys do in America. We shoot our mouths off to anyone who will listen. Sometimes doing that works out well for very talented boxers. We’ll see if that’s true for Haney. In addition, the ShoBox announcers were working hard to paint him as a top contender, but I hope he takes his time, builds his skills (and his brand) and takes a few more tough fights before challenging for a title. I’m pretty sure that’s the plan. Long-time reader (12 years or so), first time e-mail. I saw Lee Wylie make a comment on Twitter the other day that if Muhammad Ali and Ken Norton had never fought that anyone saying that Norton would beat Ali, especially by out-jabbing him, would sound crazy. That got me wondering if you, as a dedicated prognosticator of temporal-anomaly boxing hypotheticals, have any particularly bold hypothetical upsets that you feel strongly about? I’m thinking along the lines of “Ron Lyle is all wrong for Jack Dempsey” or “Marvin Johnson would have knocked out Roy Jones” or something along those lines? Thanks for being a longtimer, Luke. Describing me as “a dedicated prognosticator of temporal-anomaly boxing hypotheticals” is the geekiest and funniest thing I’ve read in years. Well done. “Hypothetical upsets”… hmmmm… I don’t know if I feel very strongly about these, but I’ll share a couple with you I’ve had in mind for awhile but I’ve have never shared because nobody ever poses them to me (mostly because the underdogs aren’t known or respected enough by younger fans). Jimmy Carter (the best version of the former three-time lightweight champ) outpoints (and puts hands on) Pernell Whitaker at 135 and 140 pounds. Duilio Loi (the former European lightweight champ and two-time junior welterweight champ from Italy) outpoints (and roughs up) Floyd Mayweather Jr. at 135 and 140 pounds. A motivated and in-shape Tim Witherspoon “is all wrong” for Mike Tyson (including the prime version of Iron Mike). Best of holidays to you and your loved ones. I have enjoyed reading you in print and digital. My comment: there hasn’t been as many great fighters as there are right now since the days of the late 1970’s to mid-80’s with something like 26 present undefeated fighters across the weight classes (after viewing The Ring ratings) and all seem to be quality, not just fighting strings of tomato cans. The PR for the sport has to be stepped up to make light of this as I am tired of listening to the “boxing is dead, MMA killed it” mantra or of recent “the Fury- Wilder fight revived it”. It has been revived in my mind for quite some time. Do you think if Jack Reiss or any ref would have allowed Tyson to continue if Stevenson’s KO in the prior fight revealed critical condition during the post-fight in the ring? Quick evaluation of the top undefeated as per Ring ratings if possible? Hearns by late stoppage or unanimous decision. Terence Crawford (34-0) – Calculating, complete fighter with a mean streak; also, a versatile switching-hitting boxer. Has the potential to be the undisputed welterweight champ if given the opportunity. Aleksandr Usyk (16-0) – Undisputed cruiserweight king. A complete, versatile southpaw boxer-technician with an uncanny engine/workrate for a 200 pounder. Has the potential to be a heavyweight threat. Naoya Inoue (17-0) – Best boxer-puncher in the sport and underrated technician. Has the potential to be the undisputed bantamweight champ, a featherweight threat, Japan’s greatest boxer AND an attraction in the U.S.
Mikey Garcia (39-0) – Best aggressive technician/counterpuncher since Juan Manuel Marquez. Has the potential to threaten the best welterweight in boxing, and to evolve into a crossover attraction. Anthony Joshua (22-0) – Calculating boxer-puncher with the most formidable heavyweight physique and tools since a young George Foreman. Has the potential to the undisputed heavyweight champ provided he put the sport before the business. My comment: there hasn’t been as many great fighters as there are right now since the days of the late 1970’s to mid-80’s with something like 26 present undefeated fighters across the weight classes (after viewing The Ring ratings) and all seem to be quality, not just fighting strings of tomato cans. I don’t agree. Firstly, I don’t think there are any “great” active fighters, unbeaten or otherwise. I think some of the current elite boxers have the potential to be greats, but they will have to earn that status with more accomplishments. Second, I think the sport had boxers just as good – or better – as today’s best in the late ‘80s, the ‘90s and the 2000s. 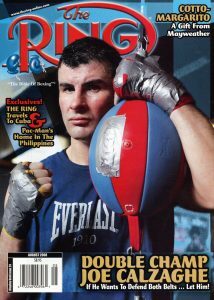 If we peep The Ring rankings from 10 years ago this month, we had Manny Pacquiao at his best, Juan Manuel Marquez the lightweight champ, Wladimir Klitschko ruling the heavyweights with a steel hand, and mid-40s Bernard Hopkins coming off a stunning upset of middleweight champ Kelly Pavlik 20 years after he turned pro. Among the best undefeated boxers at the time: Joe Calzage (46-0), Ivan Calderon (32-0), Tim Bradley (23-0), Edwin Valero (24-0) and Chris John (42-0-1). If we go back 20 years this month, we had Roy Jones Jr. and Evander Holyfield as unified champs and on top of their respective divisions (light heavy and heavyweight). We had Mark “Too Sharp” Johnson as the King of the Flies, B-Hop was in his athletic prime, on top of the middleweight division and just cracking the pound-for-pound rankings, and though Pernell Whitaker was well past his prime, Sweet Pea was still a welterweight contender. The undefeated boxers of this time were truly special: Oscar De La Hoya (28-0), Shane Mosley (28-0), Floyd Mayweather Jr. (19-0), Naseem Hamed (30-0) and Johnny Tapia (44-0-2). The PR for the sport has to be stepped up to make light of this as I am tired of listening to the “boxing is dead, MMA killed it” mantra or of recent “the Fury- Wilder fight revived it”. It has been revived in my mind for quite some time. I stopped listening to the “boxing is dead” people a long time ago. They’re dead to me, and I don’t mean that in nasty or resentful way. It’s just that they usually aren’t boxing people, are quite often mainstream media pundits who cover general sports, and I don’t pay any attention to other sports. The best PR for boxing is for the best boxers to face each other in entertaining contests that don’t end in controversy or tragedy. Do you think if Jack Reiss or any ref would have allowed Tyson to continue if Stevenson’s KO in the prior fight revealed critical condition during the post-fight in the ring? I think any good referee – and Reiss is one of the best – would have put the tragedy of Stevenson-Gvozdyk out of his or her mind before stepping into that ring inside Staples Center that night and given his or her total focus to the two battling heavyweight champs. Email Fischer at [email protected]. Follow him on Twitter and IG at @dougiefischer. And be sure to join him and the SMC track crew via Periscope every Sunday.